Many older Japanese people joined Japan's social media world in 2017. 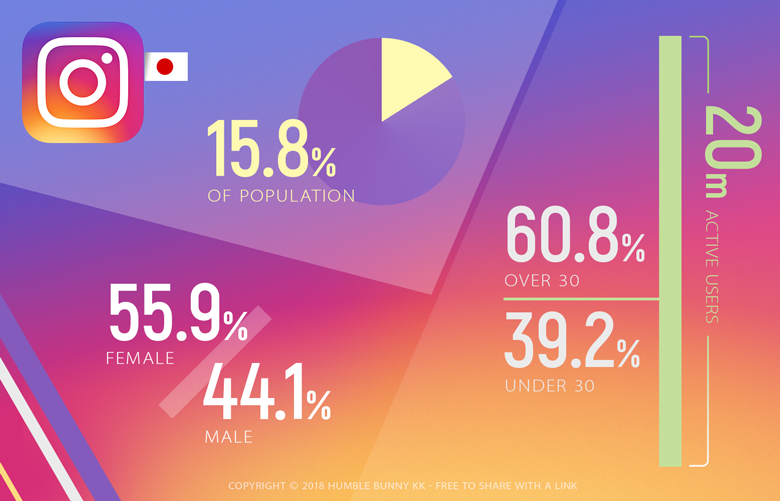 Welcome to our third annual Japanese social media report, where we bring you all of the latest stats and insights on the social media landscape in Japan. This article will highlight the most popular social networks in Japan, give insights on how users and interactions are different on each network, and give our take on where social media in Japan is headed for 2018. Please check out our reports from 2016 and 2017 If you’d like to see how things have looked in past years. Once you’re up to date, let’s take a look at what’s been happening in the last year. For 2018 statistics, please check out our latest report on social media in Japan. Twitter still holds the top crown for social media in Japan, and isn’t slowing down at all. Instagram is still growing rapidly, and was much more relevant in 2017 over 2016. Facebook maintains a strong user base that is slowly growing, although Instagram could overcome Facebook in the next year or two if current trends continue. Let’s take a deeper look into each network to see how they are changing for 2018. Considering the demographic spread here, it’s not a huge surprise that many Japanese people head to Twitter first when there is a breaking news story, weather alert, or traffic and train delays. There’s something for everyone there because, well, everyone is there! Twitter Japan even capitalized on this with a 2017 print ad campaign featuring President Trump with the hashtag “#TrumpAdministration” in Japanese. The ad’s goal was conveying that news breaks on Twitter first. Facebook is stagnating in growth, relative to Instagram and Twitter, but still remains relevant to the Japanese social media scene. The company announced that it hit 28 million users in September of 2017. Facebook usage among full-time workers in their twenties is almost double that of college students. The difference in usage rates between teens and twenty-somethings is especially drastic. Facebook usage among full time workers in their twenties is almost double that of college students. This could be due to the fact that Facebook is seen as a more professional network and even used for job hunting and business networking by young professionals in Japan. We think more Japanese people are adopting Facebook in their 20’s as a way to have a professional face online when they begin their careers. Instagram is one of the fastest growing social networks in Japan, and isn’t showing any signs of slowing down. We’re confident Instagram will continue to grow because its layout is perfect for Japanese audiences. Anonymous usernames, which helped Twitter, combined with highly visual content is a winning recipe in Japan. Plus, new features like Instagram Stories are also helping the app to stay relevant and interesting to users. As seen in previous years, Instagram Japan’s largest demographic is young females. Despite this, females over the age or 40 are the fastest growing demographic on the social network. This leads us to believe that Instagram could outshine its owner, Facebook, in Japan in the coming years. Instagram is the best social network to connect with young women in Japan. Instagram’s female majority seems strongest among college aged users. There are double the amount of female college students than males. The gender gap narrows more among full time workers in their twenties. Because of this, Instagram is the best social network to connect with young women in Japan. Instagram’s highly visual layout has opened up the doors for many new kinds of advertisements as well. Business accounts can place targeted ads within organic news feeds. Additionally ads can appear in between Instagram stories (The Instagram feature that works similarly to Snapchat stories). If you’re looking to communicate visually with young people in Japan, Instagram is a great network to be on. A Nielsen survey of Japanese college students and full time workers in their 20’s shows that both groups are highly likely to use at least two or more social networks monthly. College students are highly likely to use both Instagram and Twitter apps. Contrarily, young professionals in their 20’s are much more likely to be users of all three major social network apps. Considering this, omni-channel promotions and campaigns can be very effective for reaching young Japanese people. Since they are active on multiple networks, carry a conversation from one network to another and get dual exposure in the process. One of the biggest changes we’ve seen from the 2017 data is the influx of older users on all of Japan’s major social media networks. 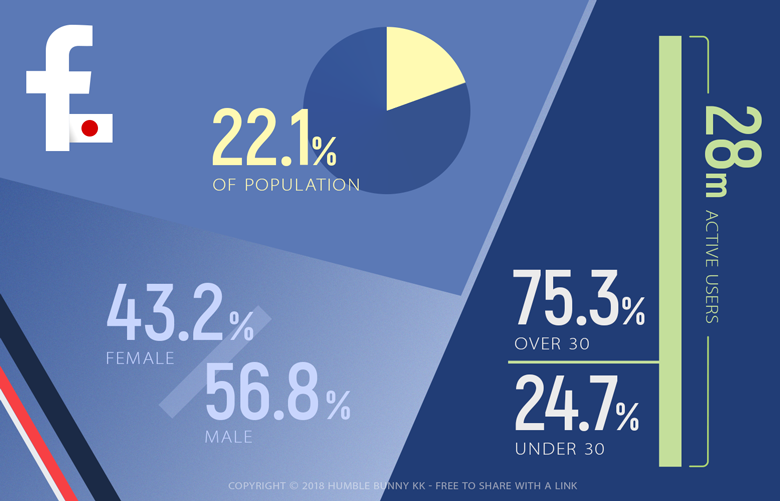 Survey data shows rising rates of male and female Facebook users over the age of 50. As mentioned above, the 50+ female demographic is the fastest growing group of Instagram users. Males in their 50’s are also growing quickly on Twitter. Along with Facebook, Twitter is now a great place to connect with older Japanese men. Additionally, Instagram is now the best place to find older Japanese women. All of this makes it seem like the older generation of Japanese people are finally getting onto the social media bandwagon. The business social network still hasn’t made a huge presence in Japan, but the platform isn’t completely dead. We’ve mentioned in previous reports about the many reasons that Japanese business culture doesn’t quite align with LinkedIn. Despite this, it is still a great place to find expats living and working in Japan. There are also many internationally focused Japanese professionals on the network. As for its Japanese users, LinkedIn is most popular among Adults in their 40’s. Despite that, LinkedIn users in their 20’s are its most active users in Japan. This could be a sign that the latest generation of workers in Japan are more interested in using social networks for business than their elders. For this reason, we wouldn’t totally rule out the possibility of a LinkedIn revival in Japan, we’re not holding our breath though. Eight was originally a business card scanning app that is now being expanded into a full fledged social media app. It seems as though it could serve as a properly localized rival to LinkedIn in Japan. What’s unique about the Eight app is that it focuses on business cards, which are still incredibly important in Japanese business culture. Users scan the business cards of professionals that they meet, and Eight automatically searches for that person’s online profiles. If the profile exists, it will prompt a connection between the users. It’s a clever way to integrate business card culture in Japan with a social media twist. If it does take off, Eight could serve as a formidable alternative to LinkedIn in Japan. The company claims to have over 1.5 million users, and is announcing an advanced recruiting function for corporate use. We’re not sure how well this network is going to play out, due to the nature of Japanese people not wanting to boast about their professional achievements. If it does take off, Eight could serve as a formidable alternative to LinkedIn in Japan. LINE is incredibly prolific, with over 71 million Japanese monthly active users, but it isn’t really used as a social network. LINE is primarily used as a messenger app, and social features such as the timeline have low usage rates among Japanese users. It should still be a part of your communications strategy, just not as a social network. Check out or other blogs to learn more about LINE’s usage in Japan, and to find advice on how to connect with Japanese LINE users. That would be a good start for you to learn how to get the best use of LINE in Japan. Older Japanese people are joining major social networks at higher rates, and this will likely continue. If older demographics are a part of your target market, 2018 is a great year to try something new with social media and get in touch with Japan’s newly social adults before your competition does. Younger users are more active on multiple social networks at the same time. They also use more networks in their twenties than as teens. We all know by now that multi-channel marketing is important in today’s world. It’s especially important when marketing to young people in Japan, as they might see your message on Instagram but be more likely to interact with it on Twitter. Don’t lose the conversion between social networks. The number of social media users in Japan will likely continue to rise, making it more relevant in the coming years. Though social media is nothing new, it would be a major loss to ignore its potential for creating awareness and leads with Japanese consumers. Are you considering a Japanese facing social media marketing campaign? We’d love offer our expertise on how to apply this knowledge to help your brand connect to the Japanese market. Please feel free to get in touch. We offer effective single and omni-channel marketing solutions that get your brand in the eyes of Japanese consumers.